The first step required to become 100% predator-free is to know for sure what type of predators are out there. The most common methods used to do this are tracking tunnels and chew cards. These tools require significant manual work and miss a lot of predators. Tracking cameras do a much better job of tracking predators and detect 2-10 times more than tracking tunnels. These tracking cameras are typically designed for tracking larger animals like pigs and deer for hunting and may not be ideal for the smaller nocturnal predators of interest to New Zealand conservation projects. To ensure that we were seeing all predators in a given area, we developed a heat camera specifically targeted at small nocturnal mammals. Initial results indicate that this picks up 2-3 times as many predators as off the shelf trail cameras due to greater sensitivity and longer range. Over the last four months, we have had 10 cameras out in the field and have collected over 50,000 videos. Obviously going through these manually is never going to be scalable and our aim has been to use artificial intelligence to assist with automatic classification of the videos. Below is an example set of videos that shows how the classifier works. On the left is the raw thermal video and on the right-hand side shows the output from the classifier. The identifier at the top is the best guess from the artificial intelligence and the number at the bottom is a real-time guess - you can see it “thinking” as the video progresses. 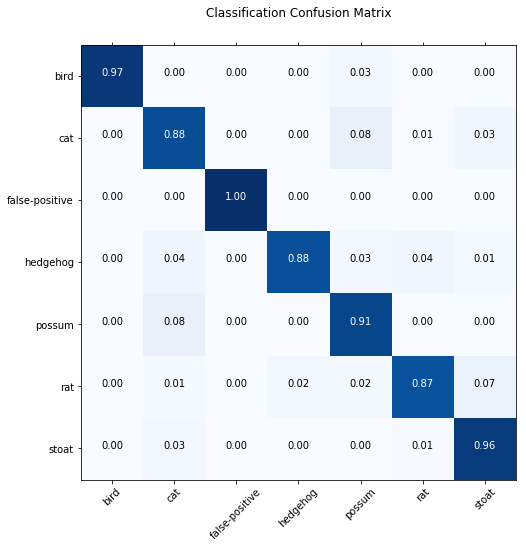 The standard way to measure the accuracy of the classifier is a confusion matrix. The number in dark blue is the overall accuracy of the identification and the other numbers show how often it gets confused between two animal types. The matrix shows the accuracy when all the videos are cut into 3-second segments. When an animal wanders just into or out of range it is obviously very hard to identify, but as it gets closer it can be identified accurately at some point during its visit. The average accuracy for this data actually improves to 99.4% when the videos are analysed on a per visit level. The level of accuracy in the confusion matrix is artificially high as we need to include more video angles and animals to accurately represent all the typical environments around New Zealand. This tool does not currently do a good job of identifying animals it has not been trained to identify, such as kiwis and humans. That said, the results so far show that if we get enough videos of the appropriate settings then Artificial Intelligence is a great tool to work out what predators are out there. This tool has the ability to make monitoring vastly more sensitive and lower cost. This will be the first application. There are currently no tools for effectively monitoring stoats, for example. The real power of this tool is the next steps which accelerate the testing of lures and elimination methods. Rather than taking years to test sound lures we should be able to test hundreds or thousands of sounds and easily analyse the data to see which ones' work in different settings. Sound lures are particularly interesting as they may be able to lure in predators from a much wider area, increasing the effective range of our cameras. Ultimately, we will be able to have a device that can activate a kill method without the need for the predator to enter a trap. Initially, tests show that we can run the Artificial Intelligence classifier in real time on the small computer that runs the camera. That means when an animal is in the target area, a kill mechanism will be able to be activated. A promising option is a paintball of poison that the predator then consumes when grooming. The initial results from the artificial intelligence predator monitor are very encouraging. The device is still in prototype form and has more work before it will be made robust and power optimised for mass adoption. Sign up for our newsletter if you want to know when they are available for testing (sign up at bottom of our website www.cacophony.org.nz). This project has been supported by The Next Foundation, Zero Invasive Predators and Jasmine Social Investments and Spark. The contribution from Spark is particularly important because as well as contributing cash they are providing hardware, expertise, free use of their data networks, and hosting our cloud storage and processing. Spark shows how modern Information technology can contribute to solving important problems in New Zealand.